World Chef APK 1.34.13 has been released, it is the latest version for Android. Social Point, the developer of the game Dragon City has just released their latest mobile game called World Chef for Android and iOS devices. 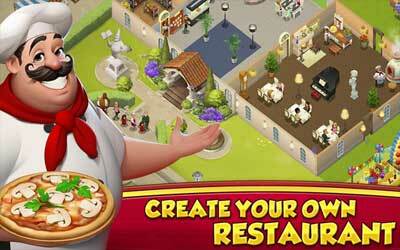 In this game you will manage a restaurant and recruit professional chefs to drive business. The first time you play, you would specify the name of the restaurant and also looking for a reliable chef. You will continue to try to achieve the greatest possible benefit to decorate the restaurant becomes better and larger. Additionally, you can also recruit better chefs from around the world. The chefs will be able to exchange recipes with each other and present a most delicious dishes. The better the reputation of your restaurant, then the celebrities would often come and become your regular customers. In fact, if your reputation is already fairly high, you can host and create a party with the celebrities. Compared with other simulators restaurant games that use time management and speed, World Chef presents a different gameplay. You have the objective to build, decorate, and be restaurant best ever. Create, customize and run your own fine dining restaurant! Buy fresh ingredients and cook increasingly delicious dishes. Serve your finest cuisine to clients from all around the world! Trade your best recipes with other chefs! At first I expected this to be like diner dash. I was wrong! There’s a lot of detail. But I love it! Getting diamonds is really simple. And you get to make your restaurant yours.